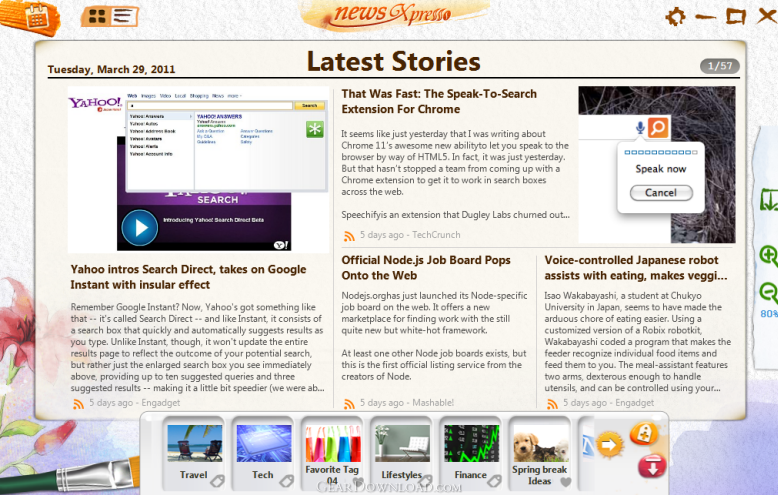 newsXpresso is a news reader with a more intuitive reading experience. Bringing relaxation and intuition to your daily news reading routine is our goal. With Latest Stories, users are able to read through the most updated news from subscribed channels either in Newspaper Layout (mimicking the look-and-feel of printed newspaper) or Catalogue Layout. newsXpresso offers three kinds of management: Channel Tag, Favorite Tag, and Filter Tag. newsXpresso brings relaxation and intuition to your daily routine. ...... With Latest Stories, users are able to read through the most updated news from subscribed channels either in Newspaper Layout (mimicking the look-and-feel of printed newspaper) or Catalogue Layout (side by side presentation). In My Channels, all your subscribed channels along with tags are listed like an index, it not only shows the title, status, and two latest news of your feed channels, but also lets you make modifications to fit your reading custom. If you would like to gather favorite news in one place, My Favorites is the feature you are looking for; it let you drag any liked news for storing, and it gets better, the text/images will be saved at the same time for offline viewing. To share liked news to your pals, simply drag to share to well-known social network sites such as Facebook and Twitter! Qweas is providing links to newsXpresso 1.0.1.0057 as a courtesy, and makes no representations regarding newsXpresso or any other applications or any information related thereto. Any questions, complaints or claims regarding this application newsXpresso 1.0.1.0057 must be directed to the appropriate software vendor. You may click the publisher link of newsXpresso on the top of this page to get more details about the vendor.